For the Suspended Spaces project, Jan Kopp covered the length and breadth of Cyprus. Anyone who has thus taken the island’s roads will have been struck by the presence of houses and buildings under construction here, there and everywhere. 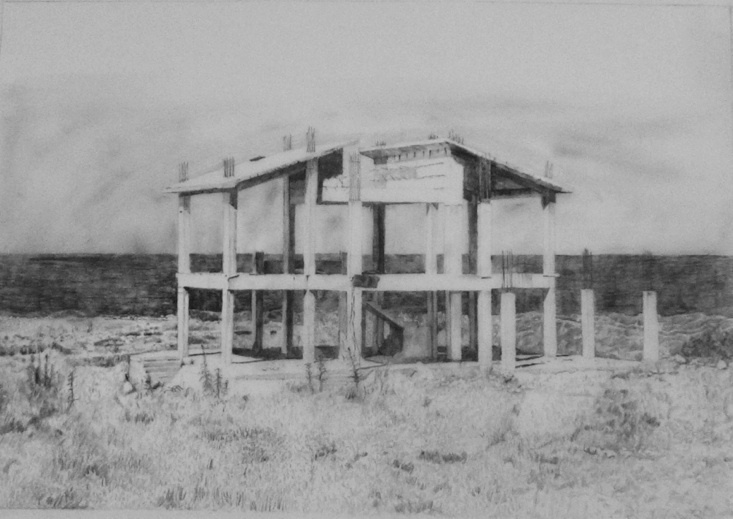 To make the animated video The House, Jan Kopp redrew a photograph which he took of one of those reinforced concrete constructions in the north part of Cyprus. This construction has remained unfinished, leftover of an uncompleted building site, one of hundreds on the island as well as elsewhere in the Mediterranean basin. Without anyone knowing why this state of affairs exists (legal, financial, political or other problems? ), Jan Kopp became particularly interested in this unfinished building “for its architecture which calls to mind the silhouette of a temple in ancient Greece”. The House is an animated film made using drawings and gouaches on tracing paper. 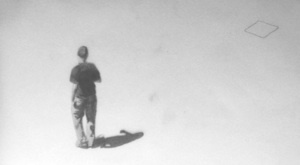 The film opens with the appearance of a dozen abstract forms, possibly resembling plastic bags flying in the wind, against a dark background which gradually turns into a seascape, a seafront with sparse vegetation. In the foreground, a dark strip represents the sea and a slightly hazy sky. The image is filled by the architectural structure, accompanied by the sound of sea and wind. The construction consists of a ground floor, an upper floor and a concrete roof, linked by a central staircase and rectangular pillars framing empty spaces, with an unencumbered view of the sea. This house under construction will be the venue and/or décor of various appearances and disappearances. 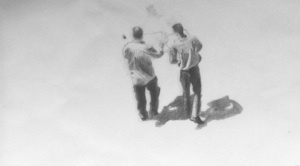 Using a fragile animation (movements that are not very flowing), forms and characters appear and disappear. To begin with, sheets are hung from every floor of the house, floating lightly in the wind, taking the place of the building’s future partitions. A small boy then starts to spin and dance, with the white sheet playing the part of a screen, to the strains of a traditional folkloric piece of music. 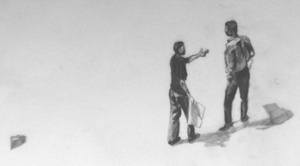 The realism of his body language suggests that the animated drawing has been made from a video or film. Accompanied by a sudden arrival of music, this little dance also emerges as an appearance, then a man appears inside the house. 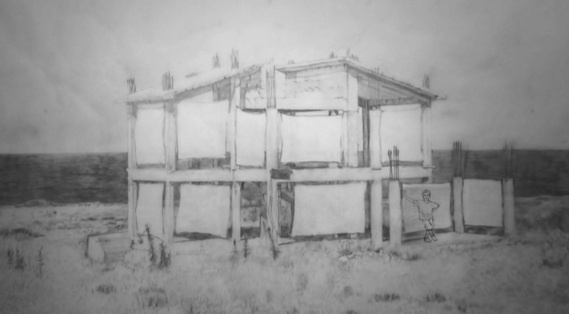 Drawn on tracing paper placed over the house, Jan Kopp’s animation lets us see his modus operandi; the boy seems included as much within the space of the house and in the physical space of the tracing paper, “on the surface”, as if placed on the background drawing. A very different shot finds its way into the video. 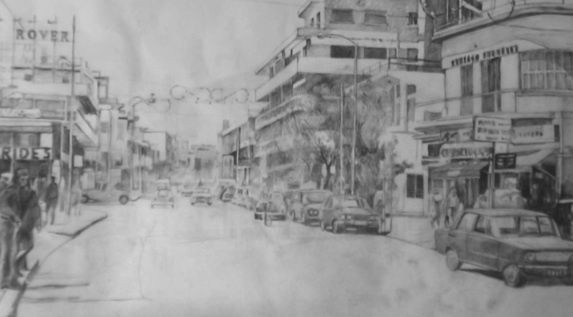 Still using this same technique of drawing with pencil on tracing paper, based on video (or film), a town appears in an expanded shot which temporarily causes the maritime site to disappear and we see three men arguing around a sheet of paper left on the road; this situation is accompanied by an ambient urban sound as well as the noises of people’s footsteps. The object of the quarrel, a newspaper, flies off into this décor, which might date from the 1960s or 1970s. End of sequence. As a moment of reality underlining the dull presence of politics, the newspaper here represents the historical background noise of the video. The sound of the sea announces the last part of the film which returns to the initial landscape of the unfinished house and the beach. The minor intrusions of floating sheets, of the squabble and of the dancing of three children which seems to take up the tiff among the men from the town, well removed from the hardness of the geometric concrete structure, all introduce a poetic and delicate eye. In the face of this imposing building which comes across like a block, the accomplishment of any planned and coherent human action seems hard to come by. Human presence seems fragile, it becomes undone and cannot appropriate any matter, identity or unity. The successive disappearance of the sheets, the house and the beach, wind up the narrative while flying abstract objects reappear.